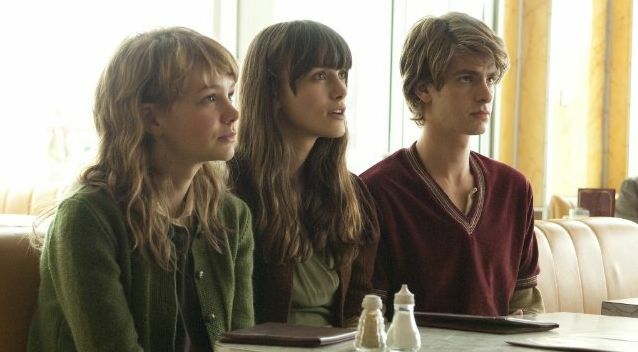 Never Let Me Go is wonderfully directed by Mark Romanek and impeccably acted by Carey Mulligan, Keira Knightley, and Andrew Garfield. I hated it. A science fiction tale set from 1978-1994 and wrapped in stoic British manners and repression, Never Let Me Go opens as Mulligan narrates her life as an organ donor, bred along with many others like her in a closed society run like a private school. They exist to provide their organs at the behest of the state when they reach adulthood; after three donations, they typically reach "completion" - they die. The first section of Never Let Me Go contains some of the finest performances by child actors I've ever seen from Izzy Meikle-Small, Ella Purnell, and Charlie Rowe as the younger versions of Mulligan, Knightley, and Garfield. (This is marred a bit by the lack of resemblance between the latter two to their adult counterparts. The children for the most part even acted circles around the more famous adults.) Mulligan's ability to cry on demand is astounding: over and over, always perfect streams down her cheeks with perfect bulbs of tears dripping down. The reveal comes early what these children's destinies are, bluntly stated, as are many of the themes and feelings between the characters later on in the picture. Little bits of information are doled out that in the world of this movie, cancer has been cured as a result of these medical breakthroughs. As they grow into adulthood still largely innocent of the world, Mulligan, Knightley and Garfield struggle not just with the physical toll being donors takes on them, but in trying to make sense of their brief, awful lives. Knightley in particular must make amends for the wrongs she has done to Mulligan in denying her love and happiness. An unintentionally but morbidly funny moment is when Knightley "completes" on the operating table; the surgeons suddenly pack up their tools and gear and hit the bricks, leaving her gaping open corpse laying there, probably for the janitor to gather up and chuck down the garbage chute. Even the evil organ harvesters in Turistas were more considerate. Together, Mulligan and Garfield attempt in vein to obtain a deferral from donation and completion because they have "true love", foolishly hoping such a "deferral" even exists. Their dilemma somewhat echos the Replicants' desire in Blade Runner to have more life. Never Let Me Go has absorbing moments but the overall effect conveyed is excruciating misery and hopelessness.